Robinia is an excellent choice for making a hedge and attracting bees! Description. Pseudo-Acacia vulgaris grown as a tree reaches a height of up to 35 m. It has a thick trunk and rough deep-furrowed bark that looks very attractive. Robinia can live for over 400 years. 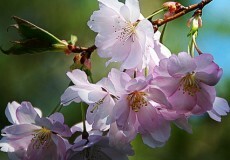 It has a powerful root system and extremely hard wood, and due to this demonstrates good wind resistance. The odd pinnate leaves remain green until the temperatures below zero and only turn yellow if the autumn is warm and long. White papilionaceous flowers (2-3 cm) with a yellow blotch are arranged in drooping clumps up to 25 cm long. Blooming starts in early May in southern regions and in late June in northern regions and lasts for about two weeks (There are even longer-blooming cultivars, like semperflorens.) The fruit is a pea-like pod 5-12 cm long with seeds up to 5 mm long. Pods typically stay on the tree for about a year. 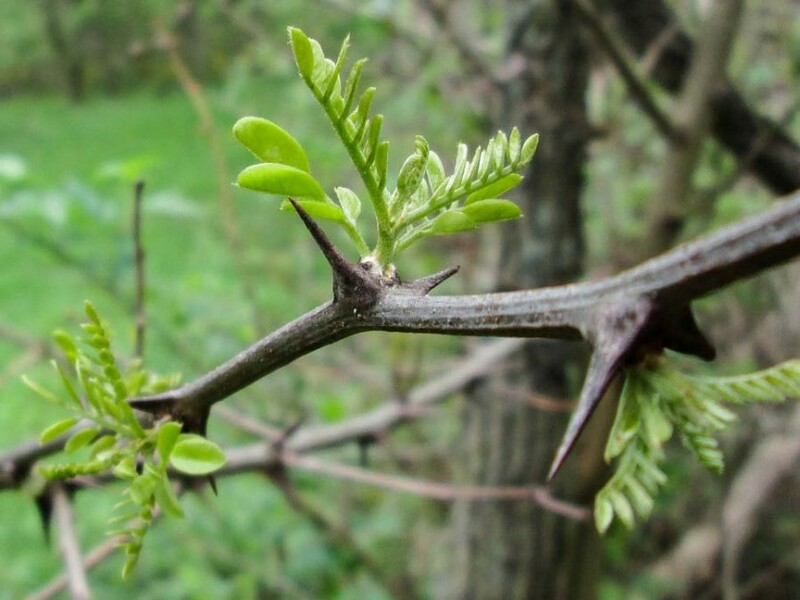 Robinia has small prickles up to 2 cm long. Being modified stipules, they only cover leaved branches. Growing Conditions. Robinia prefers full sunlight. It’s drought-resistant. On loose soils in southern regions, Black Locust is successfully used for slope erosion control and wind protection. Though it can grow on any type of soil, it prefers loose air-penetrating soil. It grows on sands, tolerates well-warmed clay and saline soils, and produces a growth of up to 1 m high on fertile soils. High ground table is not critical for Robinia (especially if it’s grown as a shrub), however it doesn’t tolerate flooding. The plant is native to North American subtropics and successfully naturalized in temperate regions on other continents. Black Locust moved north up to St. Petersburg, Moscow, and Kazan, withstanding temperatures as low as -35 ° C without any visible damage. Planting and Care. 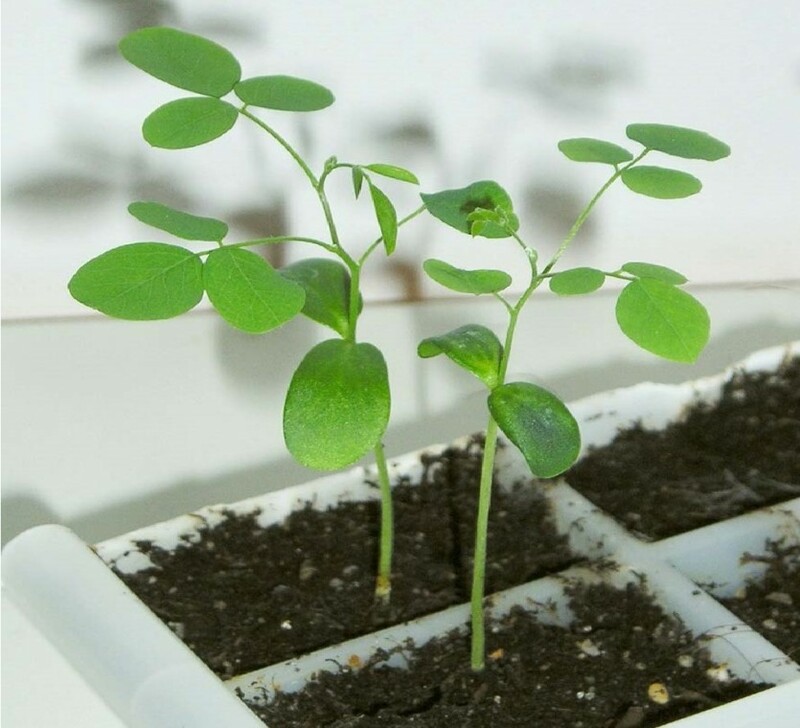 You can start Robinia from seeds, propagate it from cuttings, or buy a seedling. It should be noted that the Robinia grown from seeds is more durable and produces fewer root suckers; for a hedge, however, it’s better to use cuttings. Seeds don’t need stratification. 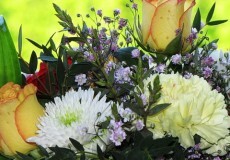 Just soak them in very warm water for 2-3 hours and change it to from time to time to keep it warm. The best potting mix is one part fertile soil (peat, humus, or organic slime) and 2 or 3 parts sand. Put the seeds at a depth of 1 cm. Germination can take one week (if the soil has enough moist and the temperature is above + 20 ° C) to one year (when planted out directly in the garden). Seedlings are planted in March or April, when the air temperature reaches + 5 to + 10 ° C. A container seedling can be planted during the entire vegetative period (Remember to shade it!). During the first one or two years, winter shelter your seedling with agro fabric and mulch with straw. Water once a week until the tree reaches a height of 2 m. If the trunk is damaged or if the branches are trimmed, Robinia produces a dense growth of root suckers, and if the trunk has been cut, the stump produces vigorous sprouts that grow up to 2 m high in one year. Some gardeners use this feature to enrich soil with organics by chipping Robinia’s branches to get mulch. However, because Robinia is prone to suckering in distress, which inhibits growth of local species, it has been listed as invasive by almost all European countries. According to my observations, Black Locust only produces thick growth on the sunny southern edges of woods, forest belts, and abandoned gardens. The northern edges are colonized by local birch and aspen species. In a forest with dense undergrowth, Robinia does not withstand competition for light with local broad-leaved species (oaks, maples, ashes, and hazels). That’s why it’s best to plant Robinia in the southern side of the garden for a hedge. Useful Qualities. Savvy gardeners plant Robinia in thorny hedges (especially in combination with gleditsia, hawthorn, and sea-buckthorn). Robinia is easy to trim and prickless varieties (for example, crispa, inermis) have been bred. 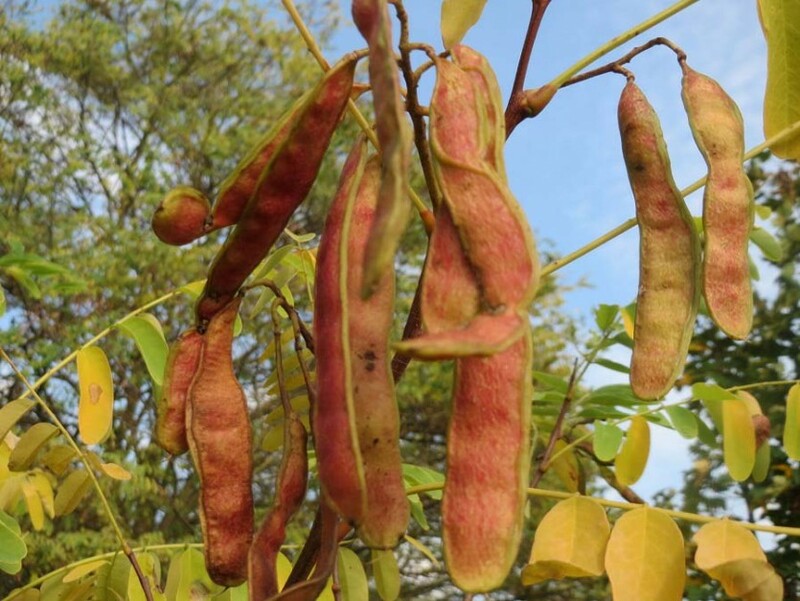 Like all legumes, Robinia is a nitrogen-fixing plant; its roots penetrate and enrich deep soil layers with soluble nitrogen, which makes Robinia an important neighbor for fruit and berry plants. The newly cut Robinia wood has a weight of about 1,150 kg per cubic meter, which is heavier than oak and almost as durable. The heartwood is rot-resistant and posts or grapes trellis from Robinia wood last for 20 years and over. The hardwood has a variety of shades from greenish-brown and brownish-green to light green. The wood polishes well and is used in carpentry. The young dark emerald foliage is considered a good feed for livestock. Almost all parts of the plant are used to produce antispasmodic, anti-inflammatory, antipyretic, and choleretic medical products. However, the best part is blooming. The more sunshine Robinia gets, the more abundantly it blooms. Robinia has a fruity fragrance and it can yield up to 300 kg of honey per hectare in temperate climates and up to 1,000 kg in southern regions. A mature tree can produce 15 kg of totally transparent and slow-to-crystallize honey. Sometimes bees are not ready for a large nectar flow from Robinia and select other honey plants so beekeepers specially prepare their bees for Black Locust. The yield per hive is up to 8 kg per day and up to 80 kg per the entire flowering period. The best temperature for nectar production is + 20 to + 25 ° C. The best nectar is produced after short night rains. Bees willingly visit Black Locust all day. Black Locust varieties feature diverse foliage. Purpurea has purple shoots, myrtifolia has very small leaves, and aureo-variegata features a golden fringe on leaves. Choose Robinia if you want to diversify honey plants for your bees, make a prickly hedge or just love abundant flowering. Black Locust will be a wonderful and fragrant addition to your garden, giving delight to you and your bees.